Garmin Nuvi 265WT is Garmin new line of Nuvi 2×5 series that focuses on high-end features for an affordable price. The device offers text-to-speech functionality, integrated Bluetooth, and free traffic service for life, all for a reasonable price of $349.99. 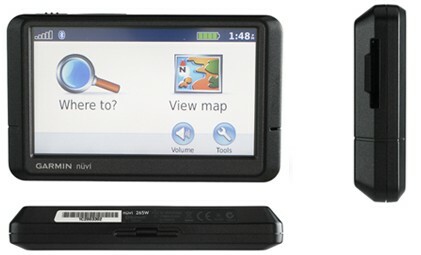 The Garmin Nuvi 265WT looks slim and simple. The unit measures 4.8 inches wide by 2.9 inches high by 0.8 inch deep and weighs 6.1 ounces. The Nuvi 265WT comes with spacious 4.3-inch WQVGA touch screen, with 480×272 pixel resolution. The device comes in easy-to-use interfaces and everything is pretty intuitive. The touch screen was responsive and the onscreen keyboard is available in QWERTY or ABC format. Predictive text is available which automatically pull up possible search results as soon as you start inputting. There’s a single power/hold switch on top of the device, SD card slot at left spine, and a mini USB port at the back together with the car charger. There are some external volume controls for easy access. It is also possible to add custom POIs, such as safety cameras and school zones and is compatible with MSN Direct services. An additional receiver and subscription fee are required in order to use MSN Direct services. Nuvi 265WT supports multidestination trips, and addition of waypoints on the fly. The user can choose three route preferences (faster time, shorter distance, or off-road) and three usage modes (automobile, bicycle, or pedestrian). The user can also choose to avoid certain road types, such as toll roads and highways. The device supports a detour function and comes with an FM traffic receiver. With that, you will get free traffic alerts for life, with traffic information provided by Navteq Traffic Network. The advertisement is the reason why the service is free that will only appear if you are stopped for more than 10 seconds. Maps are available in 2D and 3D view, and a plus and minus icon to zoom in and out. Trip information page is available to displays speed, direction, trip time, and so forth, while trip log to record distance traveled and total trip time. Voice-guided turn-by-turn directions with text-to-speech functionality is also available. The Garmin Nuvi 265WT has the “Where am I?” feature, which gives you the coordinates of your location, the nearest address, and intersection, and lists the closest hospitals, police stations, and gas stations to your position. With the Bluetooth, you will be able to call any of these services. Finally, the Nuvi 265WT comes with a number of extras, including the Garmin Lock antitheft feature, a world clock, currency and measurement converters, and a calculator. There’s also a picture viewer as well as something called Garmin Connect Photos. You can log onto the http://connect.garmin.com, choose from a selection of millions of geolocated photos, download them to your Nuvi 265WT, and then navigate to them.